DLO is an Oklahoma-based medical laboratory that each day provides laboratory testing and services to thousands of Oklahoma healthcare professionals and patients. But in many ways, we are more than that. Through our affiliation with Quest Diagnostics – the world’s leading medical lab – we are able to offer the high-quality, cutting-edge testing and services you expect from a global leader, but with the added service and convenience you get from working with a local medical lab. In fact, 95% of our tests – more than 13 million a year – are conducted in our Oklahoma laboratories. That means we can offer our clients the newest testing technologies in fields like genetics and cardiology, but also give personalized service and offer convenient patient locations. It means that tests are conducted in Oklahoma by Oklahoma medical technologists, and that if a healthcare professional ever needs assistance, we are on stand-by to assist them. 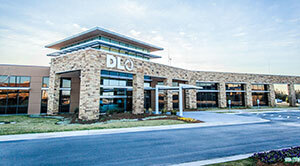 In December of 2011, we opened a brand-new Central Laboratory and Corporate Headquarters. The new facility puts all laboratory, pathology and cytology operations in one centralized location. This will lead to more efficiency in our operations and even more room to accommodate the latest in cutting-edge technology. We invite you to learn a little bit more about who we are and what we do for Oklahoma. Take a look at our Mission and Vision that guides us, the variety of services we offer, and how our more than 700 employees give back to the community that supports us.